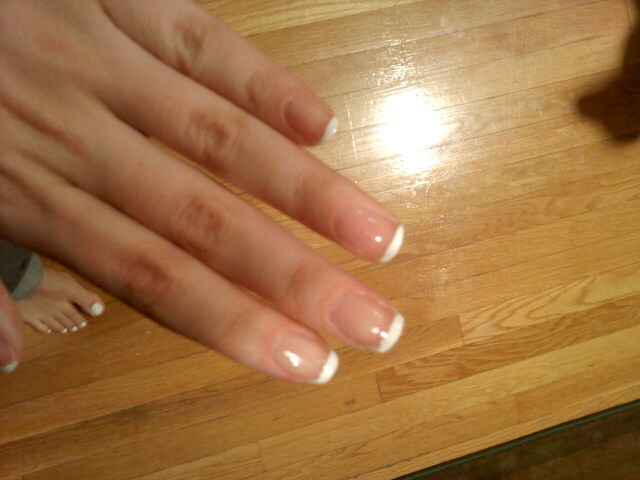 The basic French Manicure. I love, love, love this look! It can be frustrating because you can't always get the perfectly straight line doing this yourself. However, this time I placed scotch tape over my nails and it seemed to work pretty well! I found that you really need to make sure the scotch tape is touching your skin all the way around. Don't let it bubble up on the sides near where your nails meet your skin. If you do, the polish will overflow underneath the tape and you kind of defeated the purpose of it. Once the white tips dried, I also made sure to apply a top coat of clear polish. It gives the nails a nice shiny look. However, I do find that by doing this, the overall look peels sooner. The clear coat starts to chip. But, if you're using this look for a special occassion, then it works out well and the shiny coat adds a nice touch. I didn't grow my nails out very long for this one. I do think that longer nails look the best with the french manicure, but longer nails also make mistakes more obvious. For someone like me who just tries things out, the more forgiving a nail can be, the better. I also painted my toe nails but just did them a solid white. It went well together and gave me a clean look! I was so proud of my straight lines, haha! What other tips do you have from trying out do-it-yourself french manicures?